Gone are the days where you only had a few pillow fillings to choose from. Now you have a whole host of options to pick from depending on your individual needs and requirements. However, the issue this brings is it makes the decision-making process even harder. This is where we’ve stepped in to save the day by creating this easy to follow buying guide so you can discover the best latex pillow on the market available to buy today. 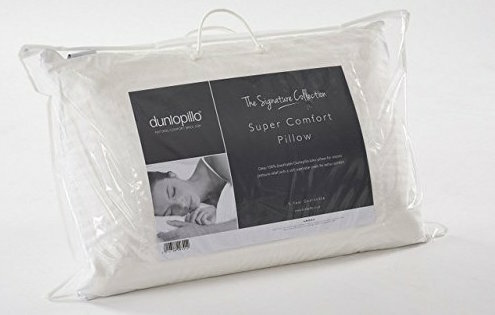 Dunlopillo has been a major player in the pillow industry for almost 100 years and has established themselves as one of the leaders by providing exceptional products for affordable prices. Their products are made from high-quality materials ensuring they last the test of time. 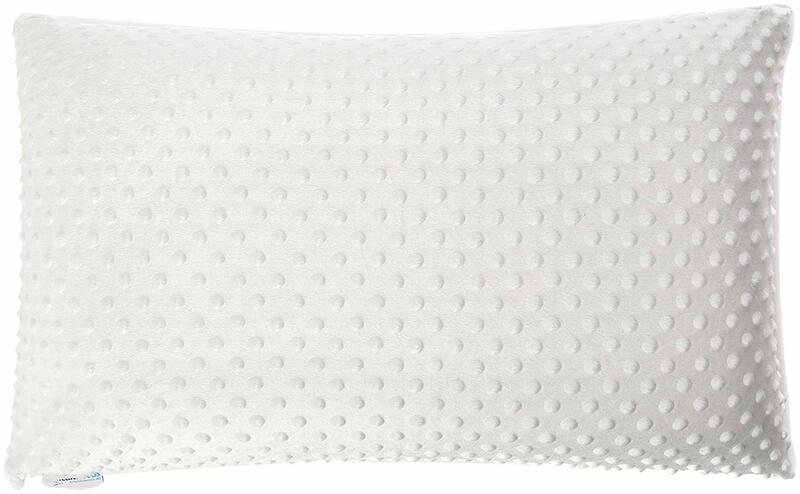 This latex pillow is part of their signature collection and is a full block of Talalay latex. When you use it, you will instantly feel the pressure relief across your head and neck, providing a medium firm feel. Despite its denseness, it has wonderful airflow keeping you cool even through the warm summer months. Also, the pillow has many health benefits including being hypo-allergenic and dust mite free, so if you either suffer from sensitive skin or allergies then this will be a perfect fit. Due to the way the pillow is constructed it aids blood circulation throughout your body improving the rate at which your tissues can repair throughout your sleep, meaning that when you wake you will be feeling more refreshed. The pillow comes with a lovely knitted removable cover which can be washed with ease. Overall this is the best latex pillow available on the market and will not disappoint. Sealy is a long established brand not just in pillows but a range of bedroom products, and have made a commitment to be a front runner in the pillow industry and have invested a significant sum of money in research and development for new products. 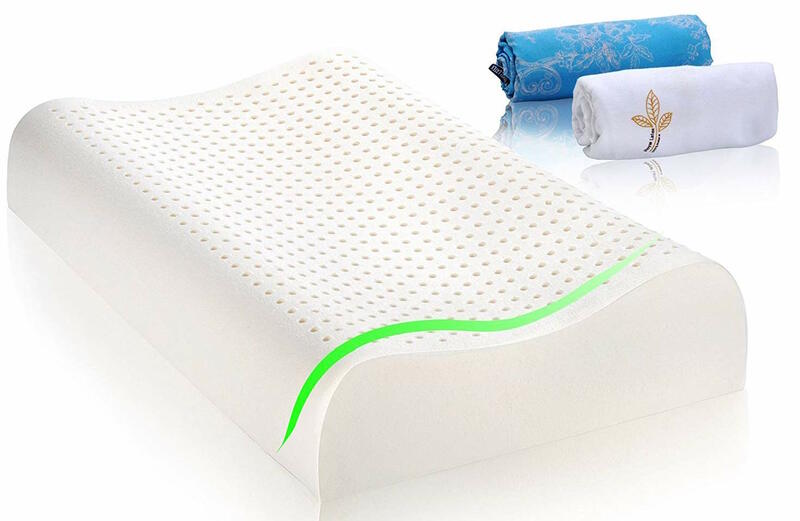 It ensures that the pillow has an optimal blend of height, firmness and size to give you a great sleep. 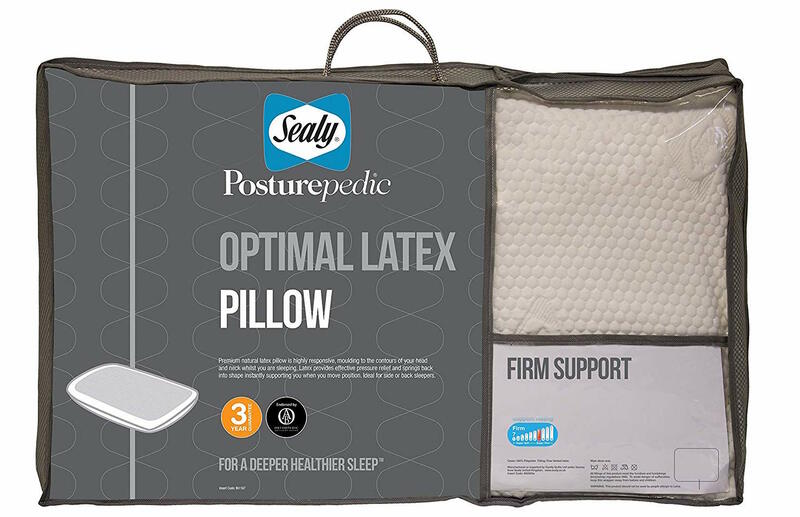 The Sealy Posturepedic Optimal Latex is built with a natural internal latex venting system which provides firm support while also having an instant bounce back whenever you change position. When you do lie in your sleeping position, you will feel the firmness activate providing you with the support and alignment that your body needs. It's designed specifically for back or side sleepers. The latex pillow is encased in a soft luxury cover which can be easily removed, and machine washed. The pillow is also resistant to dust mites and hypoallergenic. The pillow is also supplied with a three-year warranty, so if the integrity or quality of the pillow deteriorates within that time, then you are entitled to a free replacement from the manufacturer. This Talalay latex pillow has been designed to be slightly different from the traditional Latex pillow that you might find elsewhere. Unlike competitor latex pillows which are suited to back and side sleepers, this latex pillow has a lower profile and is slightly softer which makes it also great for stomach sleepers. The Talalay latex cradles and contours to the shape of your head and neck giving you unrivalled comfort while not sinking into the pillow. You will feel the pillow relieving pressure from the vulnerable areas of your body, and it’s not unusual to feel immediate benefits. The pillow improves the overall quality of your sleep. The material is breathable so you will remain cool throughout your sleep. Also, the pillow comes in a removable and washable Cooltex cover so you can not only keep the exterior fresh and, but it also keeps you cool. Also included with each purchase is a five-year warranty from the manufacturer so you can be confident in its overall build quality and know that it’s built to last. The pillow including the cover is hypoallergenic and antibacterial. Made from premium quality 100% natural foam latex, this pillow has no synthetic latex blended into it and is entirely eco-friendly. The Latex promotes natural postural alignment while you sleep and has reliable rebound properties meaning that it restores to their original size once you finish using it for the night. Because this is natural latex, it has millions of interconnecting air cells which make it breathable all year round. Its sweat-wicking qualities keep you comfortable while also being hypoallergenic and antimicrobial making it ideal for asthma and allergy sufferers. The pillow works to reduce pain and stiffness especially in the neck and shoulder area and is suited to all types of sleepers. This is because it has a low and high profile design, with the low profile suitable for back and front sleepers and the high profile best suited towards side sleepers. With a lightweight and medium feel design, it gives superior support leaving you feeling refreshed in the morning. Its money back guarantee also provided in the rare event that you’re not happy with the product, but the reviews speak for themselves to prove that it's a quality product, so you have little to worry about. The Yanis pillow is made from 100% natural Dunlop latex that moulds to the neck area to contour the delicate parts of your head to provide a comfortable sleeping experience. The latex conforms to your movements throughout your sleep to evenly distribute your weight and pressure to provide support so that you can leave those achy mornings in the past. These latex pillows do not wear down or flatten, retaining their shape for an extended period which makes it great for sleepers of all positions. Mould, germs and other dangerous microbes can’t survive because of the latex is hypoallergenic and antimicrobial. Many users have purchased this pillow having already suffered from neck pain, and this pillow has alleviated the discomfort. Yanis have managed to create a pillow that has firmness yet is soft and squishy once you’re pressed up against it. The latex pillow has a soft cotton removable cover supplied with it for straightforward cleaning. Latex pillow filling is made from sap extracted from rubber trees. The sap is then further treated using one of two methods: Talalay or Dunlop. This is where Latex pillows will vary in quality depending on the ratio of natural and synthetic/non-synthetic compounds. It's created by forming a matrix of miniature interconnected bubbles which work together to provide bounce and spring. This spongy latex material is exceptionally reactive to pressure applied but also bounces back instantly when pressure is relieved. There are several different types of Latex pillow filling that you can buy; each has its benefits and negatives so it will purely come down to personal preference. Natural Latex is made from natural components with low amounts of petrochemicals added in. Latex will always have some degree of inorganic components. However, natural latex is hypoallergenic, dust mite and mould resistant making it a great organic pillow alternative. Synthetic latex has its benefits, with the main being its affordability while mimicking the properties that natural Latex offers. The higher quality synthetic Latex will often have the same feel to its natural competitor. Latex pillows can often be manufactured from a single piece of latex or filled with shredded pieces of Latex. The main difference between shredded and solid is the airflow and overall pillow density. Solid Latex tends to be more firm and dense in feel whereas shredded latex offers better airflow and temperature regulation qualities which leads to better cooling and less overheating. There are also shredded pillows that have zipped entrances that allow you to add or remove latex pieces so you can tailor the firmness to your individual needs. Latex is generally sold and marketed as a memory foam competitor and alternative; however, they are entirely different in properties and qualities. Memory foam usually has a sinking feeling as it contours to the shape of your body, whereas latex doesn’t provide this sinking. Latex has better moisture wicking and airflow properties compared to memory foam while also being great for allergy sufferers. Benefits Of a latex pillow? Latex material is both antimicrobial, and mildew proof so will not allow the growth of allergens, which makes it great for long time sufferers. If you’re someone who is sensitive to chemical smells, then it’s advised to opt for natural over synthetic pillow filling. Latex pillows are well aerated meaning air can flow smoothly in and out of the material, which means it will retain a minimal amount of heat keeping you cool throughout the night. If you’re a fan of Memory foam, then this is a cooler version of that. Overheating throughout the night can interfere with your sleeping pattern so a Latex pillow can improve your overall sleeping experience. Latex pillows are one of the most comfortable types of pillow on the market. Over time it also holds its shape and softness because of how dense the material is. This means it lasts much longer than cotton alternatives saving you money in the long run. Latex pillows provide strong support due to the nature of Latex material which contours to the shape of your neck and head while you sleep. This minimises the chance of you waking in the morning with a sore or stiff neck. Because Latex pillows provide such excellent support, this also helps with pain relief if you’re currently suffering while you sleep. Latex pillows work to bring your head, neck, and shoulders into a natural alignment, which provides relief to pressure points along your body. Latex is naturally a soft material, which means it produces a small amount of noise when bearing your weight even when you turn in the night. This is ideal for users who are easily woken up throughout the night, while also being useful for those that share a bed with another person as they will be less likely to be disturbed if you do turn during the night. Due to the strong support that Latex pillows provide while you sleep, this helps to open up the airways which can help to reduce snoring. This is not only great for the person suffering from snoring but can also improve the sleeping experience of anyone who shares the same bed if they are often disturbed by snoring. Latex is extremely durable which leads to it lasting for several years without being replaced. During this time it will retain its shape so is an excellent investment over time as unlike other types of pillows it won’t need constant replacing. Latex is a sterile material which makes maintenance simple as it doesn’t need frequent cleaning. Latex pillows should be soaked in water or machine washed but must be spot cleaned with soap and water before ensuring that it has dried completely through before being used. Another alternative cleaning method is to have it dry cleaned. Negatives of a latex pillow? Latex pillows are often slightly more expensive than alternative fillings; however, this is because of their superior quality, materials and expected life. Natural latex pillows will be more expensive so if you’re looking for a more affordable latex pillow but still benefit, then blended, or synthetic would be suitable. Similar to memory foam, when latex pillows are new they have a distinct rubbery smell. This smell quickly disappears within just a few days; this process can be sped up if it's placed in a well-ventilated room. Because of the complex process to manufacturer latex, this has limited the number of companies who manufacture and sell them. 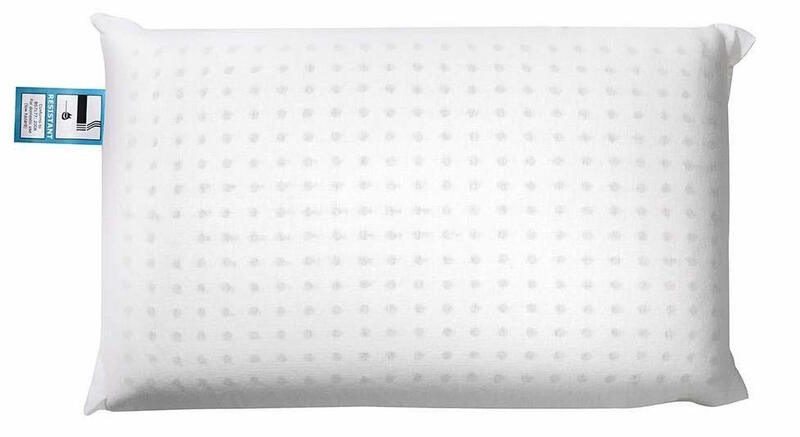 This has led to a limited amount of choice compared to other types of pillow such as memory foam or polyester. Who is a latex pillow suited to? If you sleep on your back, then the latex material will provide excellent support, but if you’re a side sleeper, then the latex works to provide enhanced support for the neck, shoulders, back and hips bringing about a full alignment of your body. If you regularly get hot throughout the night, then Latex will be a good choice because they are typically cooler than alternatives such as memory foam. Allergy sufferers will benefit significantly from this pillow because natural latex pillows are hypoallergenic while also being resistant to dust mites and mould. You can increase the hypoallergenic nature of the pillow by applying a case to the pillow. If you suffer from pain along with your neck and shoulder area, then Latex provides comfort and contouring to relieve pressure and discomfort while you sleep.